If I had something to give away I would but unfortunately all I have is kudos points, so for 10 kudos points can anyone come up with a more sensational headline that for this story. Apparently if you lived in the good ol’ USA and were a games journalist you would have received a swag bag that included a cigar, matches, a set of die, a length of wire and a pair of brass knuckles. What makes it awesome is that they have removed some of the matches, written a ladies number on the back of the match box and made the box smell like sulphur. 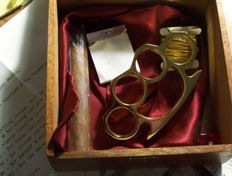 What makes it illegal is that they included an offensive weapon in the box which is illegal in many many states. So should we draw and quarter EA for sending out offensive weapons or just complain that we didn’t get ours in the country we would most probably need them?